LCROSS detects life on Earth! The Lunar Crater Observation and Sensing Satellite (LCROSS), part of the Lunar Reconnaissance Orbiter mission, performed a routine calibration of its instruments a few days ago, pointing them toward Earth and seeing what it could see. And what did it find? This spectrum covers part of the ultraviolet and visible range of light. The big dips in the line are due to absorption of light from certain molecules; these dips are like fingerprints for specific atoms and molecules. 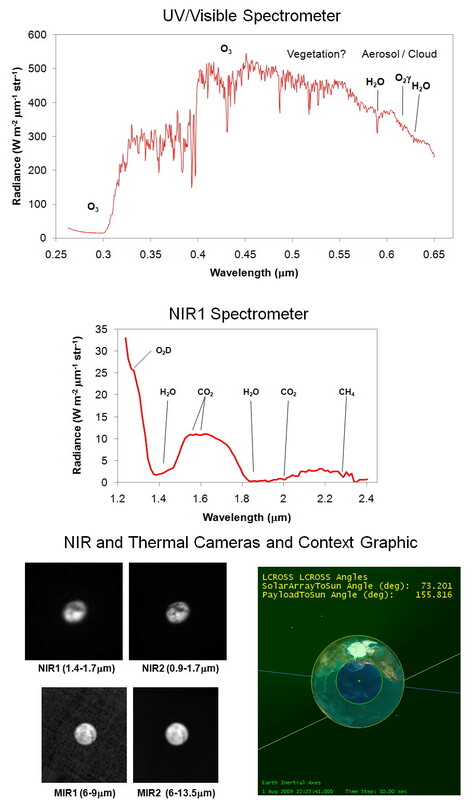 You can see that LCROSS clearly detected ozone (O3) and water, which you might see on any old planet. But it also saw a feature that is from free oxygen (O2) — it’s subtle but it’s definitely there — and that’s something you don’t see just anywhere. Why not? O2 is pretty unstable; plop some of it in a random planet’s atmosphere and in a few weeks it’ll be gone, combusted, combined with other molecules to make carbon dioxide or rust or something like that. The only reason we have a lot of it in our air (more than 20% of the Earth’s atmosphere is O2) is because we have life in the form of plants. They make it as fast as animals and chemical reactions use it up, keeping it in equilibrium. In fact, looking for free oxygen is one way scientists may eventually look for life on planets orbiting other stars. It’s an incredibly difficult observation, but not impossible, and in the future better technology may allow us to search for the elusive dip in a spectrum that tells us that aliens are breathing (or whatever aliens do) there. Incidentally, the forest of little dips in the spectrum may be due to vegetation itself, which would be a direct detection of life. I’ll take that, too. The image on the right gives you the context; North America is on the right side of the Earth, Asia/Russia on the left, and the Pacific Ocean dominating most of the view.The upper two images on the left are in the near infrared (just outside our range of vision), and the lower two farther out, where warm stuff emits IR. Note the line demarcating day and night in the top images; I suspect that’s not as obvious in the lower ones because at those wavelengths the Earth’s oceans glow whether it’s day or night. Water is slow to warm and slow to cool, and the temperature doesn’t change much from day to night. So there you go; proof of life on Earth. Maybe there are slightly easier ways of detecting it — going to the mall, for example, or poking a wasp’s nest — but this is one way that may eventually give us the answer to one of the great outstanding mysteries the Universe still has for us: are we alone? Image credit: NASA/Ames Research Center. And you can follow LCROSS on Twitter, too, which is how I found out about this!